The Rum Diary is the perfect mix, of adventure, comedy, drama and romance, with a fantastic cast and one of the most beautiful backdrops in the world. Johnny Depp, Puerto Rico and Rum. Sounds like a home run, right? You don’t know the half of it. 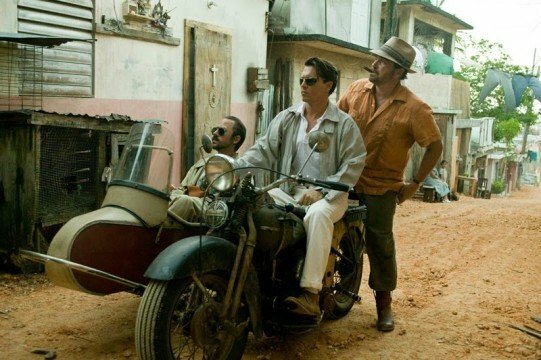 The Rum Diary is the perfect mix of adventure, comedy, drama and romance, with a fantastic cast and one of the most beautiful backdrops in the world. All the niceties aside, this film also holds something incredibly special, heart. The wonderful performance by Depp as a fictitious version of Hunter S. Thompson, in Paul Kemp, provides us with a wonderfully charismatic leading character. As Kemp navigates his ways through the Puerto Rican paradise which also mirrors a wasteland, this becomes a powerful journey of ethics and self discovery for everyone involved. Though the film is a little slow to begin with, it sends a powerful message telling us that everyone has a voice. On the surface, The Rum Diary explores Paul Kemp as just a freelance journalist who escapes the trappings of New York simply because he is just not good enough to secure a job. The initial view of Depp’s character is one who drinks too much and even if he does have talent, isn’t really in the position to use it. However, once he begins to unravel to his new landscape and to the audience, we find a somewhat tortured soul, who just like all of us, is trying to find his place in the world. We begin to fall in love with Depp’s character as his hilarious escapades evolve and the more serious side begins to expose its head. By the time Kemp is put in a position of moral and ethical compromise, we feel connected enough to this character to truly understand the conflicts in his situation. This could not have been achieved by anyone other than Johnny Depp and his hyperbolized smile in the skin of Kemp. The film has a fantastic combination of humorous and dramatic adventure that is evoked perfectly by the films wonderful and underrated director, Bruce Robinson. The great supporting cast (Aaron Eckhart, Michael Rispoli, Amber Heard, Richard Jenkins and Giovanni Ribisi) explore several very different characters in various stages of their life and they are all lovable and entrancing. The actors’ charismatic performances, especially from Giovanni Ribisi, show some extreme depth in this diverse cast. The fantastic cinematography of the beautiful and not so beautiful parts of 1960’s Puerto Rico is another highlight of the film, given to us by the incredibly talented Dariusz Wolski. Wolski has worked with Depp on many occasions including Sweeny Todd and the four Pirates Of The Caribbean and is also the man behind Ridley Scott’s Prometheus. The gorgeous depiction of this Caribbean Island allows the audience to feel the heat and the sand of the Puerto Rico backdrop as well as the vile streets and broken down shake restaurants off dirt roads. The film also holds a touching love story between Kemp and Amber Heard’s character, Chenault. The reasonable age difference in between the two isn’t even noticeable as these two similar characters explore what they truly want out of life. The chemistry is electric and passionate as is the character’s relationship. Having been a huge fan of the novel, I was surprised at the significant changes between the two mediums. In saying this, I probably prefer the film more than the book, which is saying something since the book is one of my favorites. The relationships between all the characters are better explored and the film is also much funnier than the book. Several of the changes had been at the request of Thompson before his death and I believe these add to the perfect tribute to Hunter S. Thompson and the art he created in Gonzo journalism. Though The Rum Diary won’t be everyone’s cup of tea, this is destined to be a cult classic. On top of that, the message it sends is truly universal. Lessons in life will be learnt, and stories in life deserve to be told, and The Rum Diary and the story of its creation is a lesson and story worthy of depiction. The wonderful team behind this film show passion and spirit that reins throughout and this is definitely one of my favorites of 2011.